The Philippines is an archipelago that consists of 7,641 islands with a total land area of 301,000 km2. The total area of marine waters including EEZ is 2,200,000 km2 and the total length of its coastlines is 36,289 km. 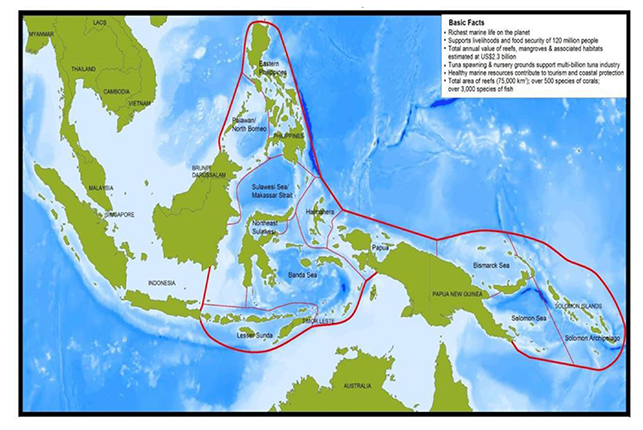 The country’s shelf and coral reef areas cover 18.46 million ha and 2.7 million ha, respectively (Figure 1) (BFAR, 2011). 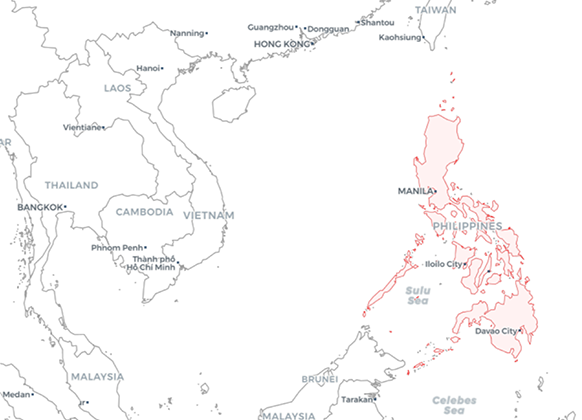 The Philippines sits at the heart of the coral triangle, which is the global center of marine biodiversity (Carpenter and Springer, 2005). About halfway between the provinces of Batangas and Mindoro, the Verde Island Passage boasts the highest concentration of marine species in the planet. Studies showed that its reefs are home to nearly 60% of the world’s known fishes, as well as over 300 species of corals (Figure 2). In 2017, the Philippines had a population of about 103 million, and mean per capita consumption of fish and fishery products of 40 kg/year or 109 grams/day with the percent of fish and fishery products intake to the total intake at 12.8%. 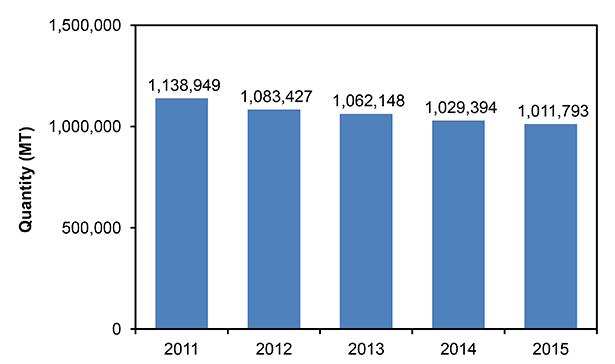 In 2015, the fishing industry contributed 1.5% and 1.7% at current and constant prices, respectively, to the country’s gross domestic products (GDP) with the fisheries sector providing employment to over 1.6 million people, 85% of whom were from the municipal fisheries and 1% from commercial fisheries, while the aquaculture sector employed 14%. However, the state of the country’s resources in municipal waters is lightly to heavily exploited and overfished. Also, the mangrove resources have already declined, and overfishing brought about by increased number of fishers and the open access to fisheries is common to both municipal and commercial fisheries. Commercial fishing boats continue operating in municipal waters that cause conflicts among resource users. The use of destructive fishing methods (e.g. dynamite and cyanide fishing, and the use of fine mesh net fishing gear) had contributed to the rapid decline of fish stocks and habitat degradation. Recently, issues on bycatch and discards in trawl and other fisheries have also been considered as threat to the country’s fisheries sustainability. The fisheries sector is classified into capture fisheries and aquaculture, where capture fisheries is subdivided into municipal, commercial, and inland fisheries. As defined under Republic Act (RA) 8550 otherwise known as the Philippine Fisheries Code of 1998 and as amended by RA 10654, municipal fisheries is traditional, artisanal, subsistence or small-scale fisheries that involves the use of vessels 3 gross tons (GT) or less as well as fishing operations that do not use fishing boats while commercial fisheries include all fishing operations that use vessels of over 3.1 GT. Inland fisheries operate in enclosed freshwater areas such as lakes and reservoirs using vessels of 3 GT or less. The country has almost 500,000 ha of inland bodies of water, comprising 246,000 ha of swamp lands, 200,000 ha of lakes, 31,000 ha of rivers, and 19,000 ha of reservoirs. Commercial fishing is classified into: a) small scale – making use of passive or active gear and utilizing fishing vessels of 3.1-20 GT; b) medium scale – utilizing active gears and vessels of 20.1-150 GT; and c) large scale – utilizing active gears and vessels of more than 150 GT. Commercial fishing vessels are required to fish outside municipal waters, which is beyond 15 km off the shoreline and are required to secure commercial fishing vessel license (CFVL) from the Bureau of Fisheries and Aquatic Resources (BFAR), which is subject to renewal every three years. The Philippines is one of the top fish producing countries in the world. 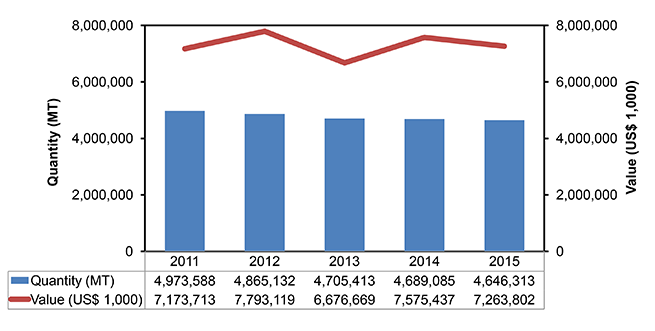 The total volume of fisheries production in the Philippines in 2015 reached 4.65 million MT with the total value of US$ 7.26 billion (Figure 3). 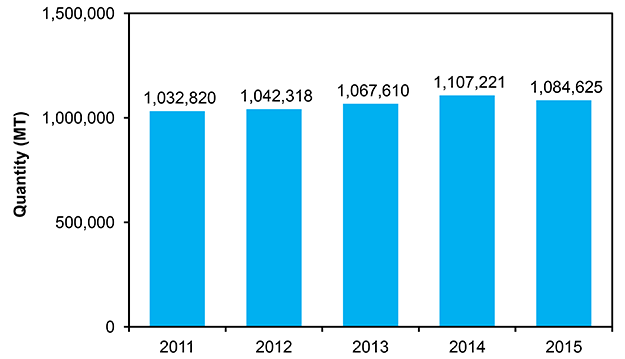 The country’s municipal fisheries contributed 1.01 million MT or 21.7% of the total fish production in 2015 (Figure 4). 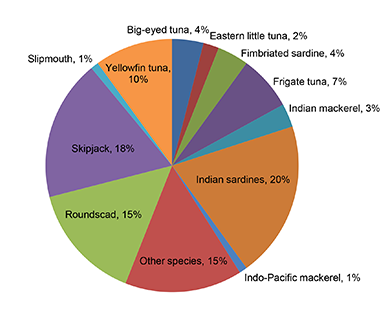 Indian sardine contributed 7%, followed by round scad and frigate tuna, at 6% each, while anchovies, Indian mackerel, yellowfin tuna, fimbriated sardine, and squid, at 4% each; and slipmouth and big-eye tuna contributed 3% and 1%, respectively. 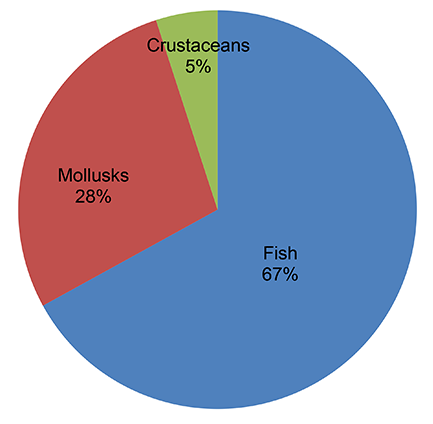 Other species provided 57% to the total marine fisheries production from municipal fisheries (Figure 5). In 2017, the total number of registered municipal fishing vessels was 247,146 in all regions of the country (Figure 6). Of the total registered municipal fishing vessels, 157,494 units (64%) are motorized while 89,652 units (37%) are non-motorized. 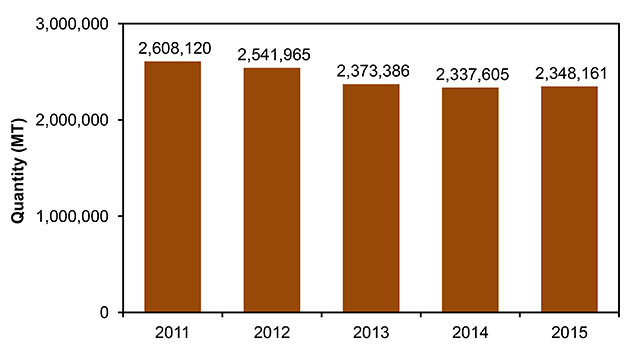 In 2016, the total number of registered municipal fishing gears was 32,482 units (Figure 7). The common fishing gears used in municipal fisheries are gillnets, hook and line, traps/pots, cast nets, beach seine, and fish corral. 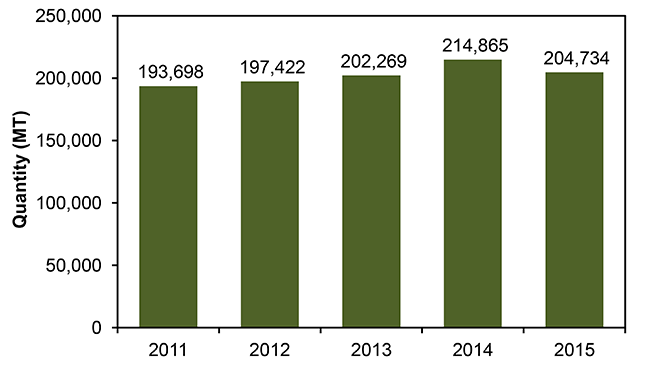 In 2015, commercial fisheries contributed 1.08 million MT or 23.3% to the country’s total fisheries production (Figure 8). 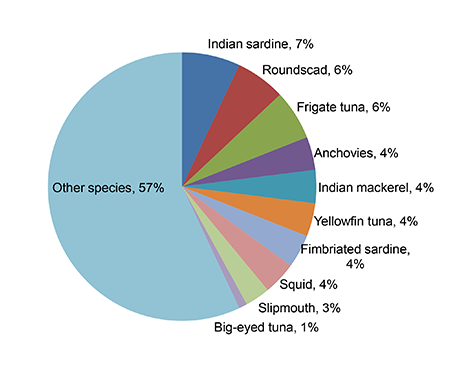 Indian sardine contributed the most, 217,758 MT or 20%. Skipjack provided 199,152.50 MT (18%), followed by round scad and yellowfin tuna that contributed 164,443.04 MT (15%) and 102,400.30 metric tons (10%), respectively (Figure 9). In 2016, the country’s total number of commercial fishing fleet comprised 3,473 vessels that were licensed by BFAR. The major commercial fishing gears used are ring net, trawl, handline, purse seine, bag net, and longline (Figure 10). 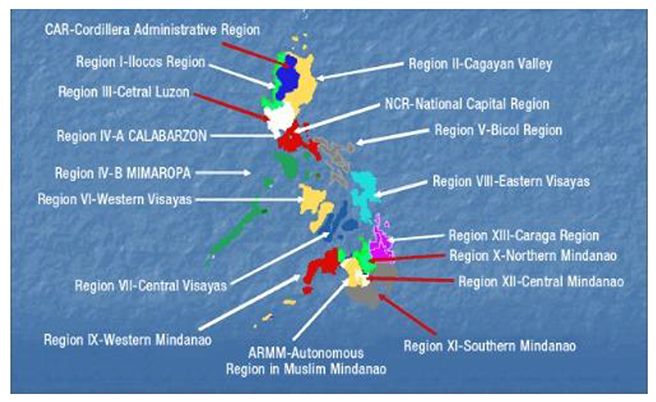 Philippine aquaculture has strong potential for further expansion and development in view of the availability of vast resources (338,393 ha of swampland, 14,531 ha of freshwater fishponds, 239,323 ha of brackishwater fishponds, 200,000 ha of lakes, 31,000 ha of rivers, and 19,000 ha of reservoirs). In the Philippines, aquaculture is categorized according to environment, farming system, farming technology, and production. Out of the total volume of fish production in 2015, the aquaculture sector contributed the most at 2.35 million MT or 50.4% (Figure 13). 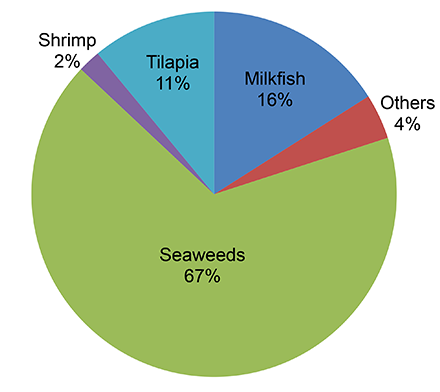 In 2015, out of the total aquaculture production, seaweeds contributed the most at 67%, while milkfish provided 16%, followed by tilapia at 11%, and shrimp/prawn at 2% (Figure 14). The country’s fish catch are sold in local markets although significant portion especially shrimps are shipped to Manila or other urban areas. Around 70% of the catch is consumed fresh or chilled, while 30% is processed (cured, canned, frozen products or disposed of live). The bulk of cured fish and fishery products are consumed locally, while only a small quantity is exported as ethnic products. Fish drying is the most common form of processing particularly the smaller size species caught by commercial trawlers. Smoked and salted fish are also to a lesser extent, prepared in various forms for selected species like the anchovies. Canned products, particularly tuna, are consumed locally in smaller quantities compared with the export volume, and most of the frozen products are meant for export. Trash fish or bycatch locally known as “rejects” from trawl is an important feed component in the aquaculture of high value species like grouper, sea bass, and mud crab for fattening, and fed as fresh whole or in chopped form. Also used as raw materials in the preparation of local fishmeal, trash fish is most of the time handled onboard without any preservation or icing. Those that are caught from short fishing trips (usually overnight) are often of better quality and are commonly used for human consumption (fresh or dried). Trash fish caught from longer fishing trips are normally sold fresh or dried to be used as feeds for aquaculture and swine, and as raw materials in fish/feed meal manufacturing plants. Tuna remained as the country’s top export commodity with a volume of 97,815 MT as fresh/chilled/frozen, smoked/dried, and canned tuna products valued at US$ 231 million. The three major export commodities (tuna, seaweeds, shrimp/prawn) combined account for 63% (153,667 MT) of the total export volume (226,821 MT) and 58% (US$ 531,333 million) of the total export value of US$ 909 million. Other exported major fishery products, e.g. crabs, crab fats, octopus, grouper, cuttlefish, squid, ornamental fish, round scad, and sea cucumber constitute 21% or US$ 189 million of the total export revenues. The other commodities accounted for the remaining 21% of the total export value. In terms of value, the major destinations of Philippine fishery products are USA (24%), Japan (13%), Hong Kong (9%), Germany (6%), China (4.8%), Taiwan (3.7%), UK (3.6%), Spain (3.3%), Netherlands (2.1%), South Korea (1.9%), and others (28%). In 2015, the country’s fishery imports originated from the following major countries in terms of value: China (24%), Vietnam (13%), Papua New Guinea (13%), Taiwan (12%), Korea (8%), Japan (6%), USA (4%), Norway (3%), Indonesia (2%), Denmark (1%), and other countries (18%). Fifty-two percent of the total import value was contributed by the three major commodities: 62% chilled/frozen fish, 1.8% prawn feeds; as well as flour, meals and pellets of fish, crustaceans, and mollusks fit and unfit for human consumption, 3.2%. These commodities have an aggregated value of US$ 275 million out of the US$ 414 million total import value. Through BFAR, the present administration focuses on the five-year Fisheries Development Plan 2016-2020, which ensures that all interventions are holistic and coordinated to achieve food security and inclusive growth. The plan also aims to enhance the governance of marine resources and strengthen the law enforcement, particularly for the Local Government Units to guarantee resource sustainability. Moreover, the plan implements measures that warrant resiliency to environmental and climate hazards, and also aims to develop the full potentials of aquaculture to increase production and reduce post-harvest losses, making sure that international standards are complied with in order to bring in revenue from products exported to major international markets. The Republic Act (RA) 10654 amending the Fisheries Code of 1998 (RA 8550) sets out the general framework for managing the country’s fisheries sector with the BFAR as leading government agency responsible for conservation and management of fishery resources beyond municipal waters. The Local Government Code of 1991 (RA 7160) provides the local government units (municipal and city governments) the jurisdiction and responsibility to manage the fisheries within their jurisdiction (municipal waters within 15 km from the shoreline), and grants preferential use of municipal waters to municipal or small-scale fishers. The Agriculture and Fisheries Modernization Act of 1997 (RA 8435) sets out measures to modernize the fisheries sector particularly on credits and extension. The Philippines as party to existing international and regional commitments/arrangements supports measures relevant to bycatch management and discards reduction set out by such arrangements including the regulations of Regional Fisheries Management Organizations (RFMOs) in the Western and Central Pacific Fisheries Commission (WCPFC). Magna Carta of Women mandates non-discriminatory and pro-gender equality and equity measures to enable women’s participation in the formulation, implementation, and evaluation of policies, plans, and programs for national, regional, and local development. Framework Plan for Women (FPW) indicates actions planned for gender responsive governance to be undertaken by government agencies, LGUs and civil society. Department of Budget and Management (DBM) has issued annual budget circulars since 1997 that support the implementation of Gender Advocacy Development (GAD) budgets at the local level. The BFAR has been actively spearheading GAD programs in the fisheries sector. FAOSTAT. 2018. Statistics Division, Food and Agriculture Organization of the United Nations. Available at http://www.fao.org/faostat/en/#country/171. Accessed on 28 May 2018.